Are you hot and sweaty? Let's have some wet and wild summer fun. You know the kids will be on this all day long the. 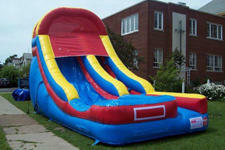 When the temperatures soar this slide goes out just about every day. For the customers on wells, good news is that it uses about same amount of water that a typical bath would require.